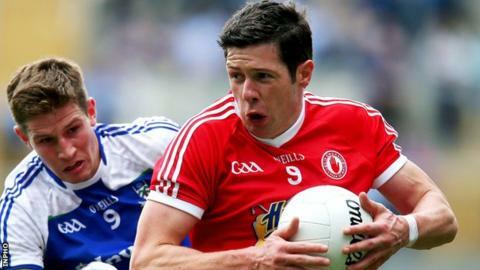 Tyrone's Sean Cavanagh picked up his fifth All Star at Friday night's end-of-season GAA awards ceremony. Two players from Ulster champions Monaghan - defender Colin Walshe and forward Conor McManus also won All Stars at the Croke Park banquet. Full-forward Bernard Brogan, who scored two goals in an the All-Ireland final victory over Mayo, was one of six Dublin players honoured. Dublin's Michael Darragh MacAuley was named footballer of the year. The Dubs captain, goalkeeper Stephen Cluxton, landed his fifth award, equalling the haul achieved by legendary county netminder John O'Leary. Rory O'Carroll, Cian O'Sullivan and Paul Flynn were the other Dublin men to win places in the 15. Beaten All-Ireland finalists and Connacht champions Mayo had four award winners. Kerry's Colm Cooper won his eighth All Star award and there were seven first time winners in O'Carroll, Keith Higgins, Colm Boyle, Cian O'Sullivan, Aidan O'Shea, James O'Donoghue and Monaghan's McManus. Monaghan's recognition follows their first Ulster Championship win for 25 years, beating favourites Donegal 0-13 0-07 in July's provincial final. Tyrone star Cavanagh hit the headlines in August when he was fiercely criticised by TV pundit Joe Brolly for a foul on Monaghan forward McManus during the All-Ireland quarter-final.